I used to find a lot of really cool stones by a river in New Jersey and paint them. 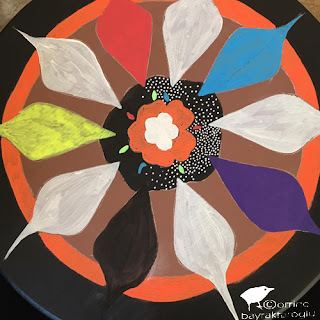 I haven't found any around here that are irregular AND smooth to paint so instead I just do decoupage or quick one's for found art. 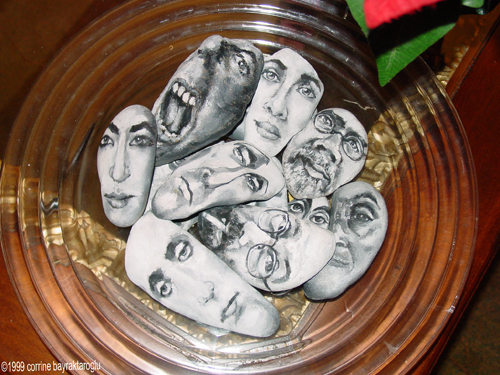 In the bowl is Orson Wells, Chuck Close, and Edith Sitwell. Can you tell which one's? There is a Greek myth that when Zeus sent a deluge as punishment for human wickedness Deucalion and his wife, Pyrrha, were saved in an ark. When the flood waters subsided, Themis instructed them to repopulate the earth and said, “With veiled heads and loosened robes throw behind you as you go the bones of your great mother.” They took this to mean stones of the mother earth. As they cast the stones behind them those thrown by Deucalion became men and those thrown by Pyrrha became women. It is from this that they say the hardness of our race is considered the living proof of its own origin. Those stones are amazing, fabulous art, I love it because it's art and nature at work all at the same time. I love the stone faces and the story about Deucalion. lovely posting. Thanks. Beautiful stones with personality and a fascinating legend to go with them, woohoo!! I'll tell you a funny coincidence. J.B. right before I clicked on your blog I had just finished washing a cracked round interesting rock I picked out of the creek on our last visit to Kentucky. I can see little sparklers in part of the chipped area and I'm wondering if it has one of those crystal treasures hidden inside. Rocks rock and I love 'em! I'll put a photo of my creek rock in my blog. Hi margaret,I was researching stones and the ancient myths that go with them a long time ago and found this myth really interesting. Lyn, that is a coincidence LOL! I look forward to seeing the pic of it. A gal after me own heart eh, can't resist picking up stones. Love the rocks! Also Chuck Close is one of my favorite artists. What fun! I am planning to go tubing on the Hiawassee River near Chattanooga, TN this weekend. Maybe it will have some cool rocks that I can paint on. Oh JB yes yes I have always been fascinated by rocks!! I was always looking around on the ground and finding strange and unique rocks. I will take pics of them and post them in my blog. I'm going to post one of 'em now. it is so beyong beautiful and has a special place in my headboard..
when i saw what you did with these stones i just had to share..good job hon..as usual. hugs. These faces are wonderful, you are very talented. Great pictures. Neet legend. Something new here all the time. What a fine group of art pieces! 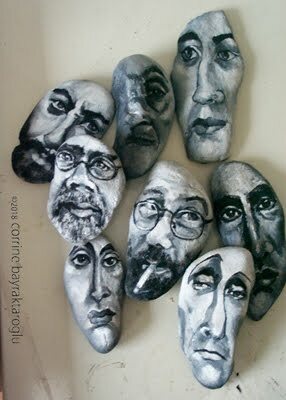 I like rocks as well, but not to the extent of painting on them! Those are fabulous - I'd love to be able to do that (or at least own that).